When you’re studying to be exoveterinarian specializing in exotic, alien life forms, school… is a different kind of animal. From a young age, Zenn knew that she wanted to work with animals. The daughter of a highly respected exo-veterinarian, Zenn knows firsthand how wondrous – and potentially dangerous – large alien animal life can be. After her mother dies performing a tricky in-body pod surgery on an Indra (a massive animal that has the ability to tunnel through space and time itself), Zenn’s life is irreparably changed. Her father is torn by his grief and distances himself from his only child, leaving Zenn to grow up on Mars in the Ciscan Cloister Exovet Clinic under the watch of his brother, Otha. Things aren’t all bad, though – like Zenn’s mother, Otha is an exovet and under his watch, Zenn becomes a novice veterinarian working towards getting approved for a license to practice. At just seventeen, she has more experience working with alien animals than most, and is ready to undergo her three final exams. Unfortunately, Zenn can’t seem to catch a break, as strange mishaps popup throughout the cloister and with clients’ animals – everything that can go wrong does go wrong, from mixed up medicines to unsecured containers for the animal patients. There’s also the troubling matter of Zenn’s secret ability to telepathically sense and connect with the animals she’s treating – while this sounds like a cool thing, there’s nothing worse than accidentally bonding with a creature right before you’re going to flush its enormous eye out with a hose full of medicine. Zenn can’t really tell anyone about her unique ability, for fear that they’ll think she’s cracking under the pressure (or worse). Exacerbating the situation even further there are also the dual problems of finances and general ill-will towards the Ciscan cloister. Political tensions between Mars and Earth are at a new high, plus food shortages and with decaying technology drives Martian humans from their homes and into shantytowns around over-populated (and over-farmed) cities. The displaced people look at the big fancy Ciscan clinic (and all the food given to its big fancy off-world animals) with resentment. Meanwhile, clients are coming less and less frequently to the clinic on the hostile, backwater planet, leaving the cloister unable to pay its mortgage and other bills on time. Needless to say, things are pretty dire for Zenn and her family – so when animals start escaping from the cloister and start causing trouble with the locals, it inflames an already volatile and hostile environment. Let’s start with the good stuff. On the positive side, Zenn Scarlett has, as I’ve mentioned, some really awesome ideas. I love the setup for the book and the vision of a hardscrabble Mars, only partially terraformed and desperately dependent on technology that is now gradually failing. Mars is framed as a kind of wild, untamed homesteading environment, in which people scrape by to make their living and survive on the unforgiving planet, and I loved the juxtaposition of weatherworn farmers against the ailing Ciscan cloister. The animosity towards alien creatures and the humans that invite those creatures within their walls is a great driving conflict for the story, as is the question of sabotage within the cloister itself. Also on the positive side, I do love the idea of Zenn as our heroine – she’s an even-headed, fearless, and determined gal that faces serious tests and adversity. Although she fails at things – repeatedly (but more on that later) – she never stops trying, and that kind of tenacity is wonderful. I also love the complicated relationship she has with her erstwhile father and caring but tough Uncle (who treats Zenn as he would any student apprentice – painfully critical, but extremely fair). I even like the basic idea that Zenn can telepathically bond with animals and her respect for all living things, big or small. That is all to say: the big ideas behind the book, the premise of the book, and the broad strokes of character and plot are all wonderfully conceived. The problem, however, comes in the execution. For all that Zenn Scarlett should have a defined set of conflicts at its core (the possible sabotage of animals/enclosings, Zenn’s startling and inconvenient telepathy, the increasing tensions between the cloister and human martians), the story is awfully repetitive and plodding. Much of the book involves Zenn trying to do some varied exovet task that should be easy, followed by her flubbing up the task due to her telepathy and subsequent self-questioning over said flub-up. While we get to meet many different types of alien life forms, which is initially and potentially interesting, there’s so much needless action that does nothing to advance the story. Take for example the lengthy chapter devoted to Zenn saving a cat named Zeus using a highly manual machine process or Zenn’s treatment of a whalehound and long-winded return of that whalehound to foreign royal stewards. Neither of these interactions have any bearing or significance to the plot in any way. While these are fine little episodes, Zenn Scarlett is full of such extraneous mundane adventures that are only tenuously connected to the actual story. And, on that note, how do all of the animals eat the same food (WHERE does the cloister food come from?? ), and breathe the same oxygen as humans? Especially one whalehound that lives in water environments and eats whale sized prey (as a fellow blogger mentioned, why in the world would you bring an ocean-dwelling animal to a dust planet??? ), or a Tanduan swamp creature (on a world that ostensibly doesn’t have any swamps) for that matter? I’m fine and good with the science fantasy of alien creatures, but there are a few too many gaps in Zenn Scarlett to fully suspend disbelief. These holes and problems extend beyond the alien critters, too. In terms of plotting, the actual meat and potatoes of the story doesn’t even kick off until you’re about a third through the book – meanwhile, the entire first third is devoted to internal infodump and external explanation infodump. That is, Zenn either thinks these things to herself, or lectures towner boy Liam or alien sexton Hamish at length about alien physiology, the history of Earth-Mars-alien relations, taking breaks to pose such philosophical arguments like, “to the aliens, HUMANS are aliens.” This makes for a clunky read, as you might imagine. Compounding the infodump/lack of meaningful action issue, there’s also the unanswered question problem. Namely, WHY in the world is Zenn telepathic, and what does this have to do with anything? Why did humans go to Mars in the first place only to abandon it (and if sentiments are so strongly against other planets, when/why did humanity take to the stars)? What is the deal with Zenn’s father and missing mother? So many unanswered questions. These are likely going to be explained in future volumes, but considering how these huge glaring questions are almost completely ignored in this book, I’m a little worried about future installments. Finally, there’s the simple problem of repetition and style. Zenn’s thoughts are on a constant loop; I swear, if I have to read another internal monologue about THE RULE and how she Must Not Get Close to anyone – which is painfully forced, I might add – I’m going to walk out of the next airlock into the vacuum of space. The love interest is similarly forced and half-baked, and the ultimate villain of this piece (and the involved parties) is pretty transparent. There’s also the niggling problem of character portrayal. While the political tensions are a nice touch, and I like the idea of Mars being akin to the dusty American wild west, the one-dimensional portrayal of the people of Mars with their backwoods bumpkin accents (complete with spittin’ and hollerin’) and incessant xenophobia is also over the top – not to mention problematic. Ultimately, I’m disappointed with Zenn Scarlett – a disappointment that is all the more painful because it’s clear there is a great story in these pages, but it desperately needed shaping, nurturing and editing. Wind clawed at the canvas tarp covering Zenn in the cargo bed of the ancient pickup truck. The truck picked up speed, rattling and bucking down the rutted dirt road, and it took all her strength to keep the coarse cloth from being ripped out of her hands. But more speed was good. It meant her father and Otha hadn’t noticed her hiding beneath the tarp… yet. The truck hit a bump; she lifted several inches into the air, then came down painfully against the rusty surface. That was the first rule, the important rule. Bad things happened outside the cloister walls. Frightening things. Lurching and bouncing in the back of the speeding truck, Zenn was fairly certain she was already as frightened as it was possible to be. But breaking the first rule was only part of what made her heart leap inside her like a cornered animal. The other fearful thing floated somewhere far beyond the Martian sky above – a starship. Inside it was an Indra, one of the biggest, most astonishing creatures in the known universe. And trapped inside the Indra’s body, was Zenn’s mother. Zenn knew something was wrong the moment her uncle rushed into the cloister yard earlier that morning. He was breathless from running. Otha was a big man, and he seldom ran. 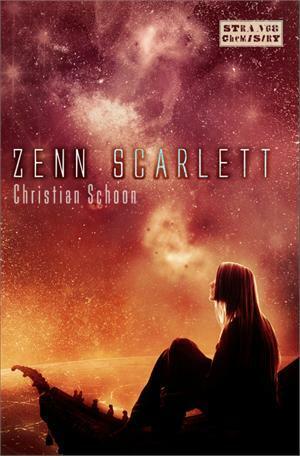 For more about Zenn Scarlett, check out our interview with author Christian Schoon HERE. Omg, yes, why??? It actually took me a while to figure out what the actual plot was supposed to be because it could have gone down any of those lines of Zenn’s father, Zenn’s abilities, or the cloister’s troubles. Wow, I hadn’t even thought about the whalehound being on a dustball, haha, I think I was still too distracted by figuring out the plot 😉 Excellent review!